Now that you've seen the outside of the Junk House, it's time to venture inside. The kitchen was, of course, the most consuming individual room of the remodel. It was actually remodeled twice. Once, from the initial gutting, and then again when we decided to make the house our permanent home. You see, we were just going to live in the house while we were building our new home. In order to make it livable though, we had to put a lot of time and money into it...windows, insulation, all new siding, and total reinforcement of the non-existent foundation (remember, we're 97 years old). In that process, the place started to grow on us, and we decided to make it our permanent home. While the house was just fine for a temporary place to live, knowing we were going to live here for a very long time made us re-think the big picture and function of the current floor plan. Unfortunately, we ended up re-doing and un-doing some of our recently completed remodeling projects. It almost killed my husband to take out/move walls that had just been freshly sheet rocked, painted and trimmed out. I cannot begin to describe how disgusting the kitchen was. It's hard to see just how grimy and gross it was in this scanned photo. Cedar shakes ran around the tops of the cabinets, the light fixtures were covered with thick brown dirt and when we removed the cupboards, we found a mouse graveyard. Blech! I have tried to stand in the same spot for the after pictures to give a good idea of how things have changed. 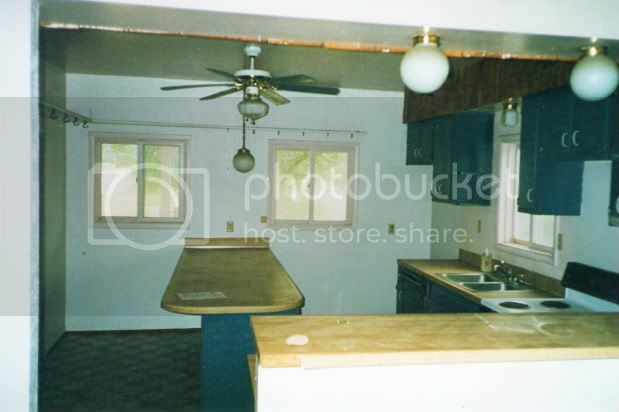 I think the only thing that stayed the same is the kitchen window over the sink, which isn't visible in this shot. Below is the view from the living room, through the dining room. We added the wall between the kitchen and dining room. For phase two of the kitchen remodel, we took out a wall to make the kitchen bigger and added another wall of cabinets. I love my kitchen. I love the vintage/retro feel. If there was room, I would have a bigger eating bar, but we make due with the two seater. That's the only thing I think I would change. You are an awesome kitchen. You have cooked lots of hearty meals for the men in my life, and they are grateful. On occasion, you crank out some great chick food too, for me and whatever girls I can convince to visit! The only issue I have with you is that somehow you are letting the occasional mouse get in under my sink. I have done my part with a can of spray foam, but somehow they seem to sneak by on the rare occasion. Is there a secret passage I don't know about? I don't appreciate you fraternizing with the enemy, and feel we really need to deal with this, then we can get back to our normal, great relationship. I look forward to many more culinary adventures together. You're a good, hardworking kitchen. p.s. It is hard to take good indoor pictures! I had the toughest time getting accurate color and exposure. The walls in the kitchen are a light apple green, but I couldn't seem to get that to show up right. Your kitchen is fabulous! I love the retro feel and colours. Beautiful blog ~ looking forward to stopping by often. Oh my! Love it! But, I think you were rather rude in your earlier post in the way you talked about your junk house. She is wonderful! Refrigerator, hot tub and all. I want to hear a lot more appreciation for her hanging in there through people who put all that stuff on her. Ha, ha- can't wait to see more! Unbelievably pretty! Great job on the remodel. Your home is beautiful. I love the colors - it looks happy. Ooooooh. Something tells me I'm going to love your new blog! Thanks to Jen for sending me over. Oh my goodness! I love your blog! It is so refreshing and full of life! Keep posting! You are an inspiration! 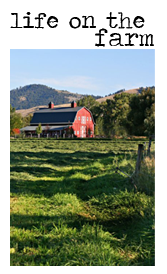 Your farm home is beautiful and I see lots of love in every nook and cranny! You are quite good with your camera to! Wow! Great job on your kitchen and great job on your pictures too. You are right, indoor pictures can be pretty tough. Love your whole blog. All the color is so bright and cheery. I just found your blog and I love the eye candy! Your kitchen just feels so cheery and bright. I bet it's gorgeous with all your colors at the holidays. Show us more please! Its happy, is what it is. And it is welcoming. Come on in and make some waffles, it says. There's fresh berries in the fridge, and real maple syrup too. Hi I followed the link by Jen too. I absolutely adore your kitchen! Great job! Your kitchen is inspiring!! 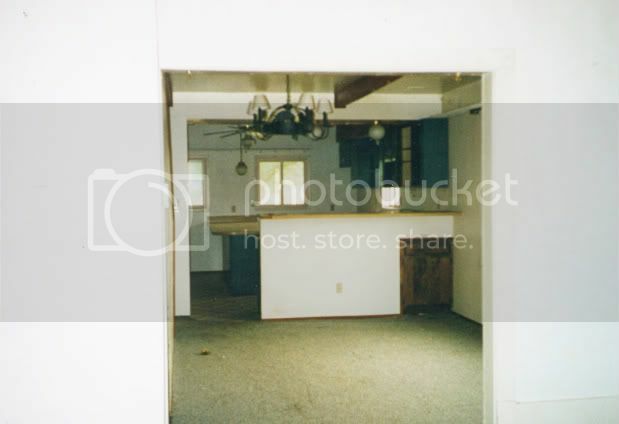 I own a 1950's home whose kitchen needs to be remodeled in the worst way. I too am afraid we will find mice carcasses when we demo it!! Will you tell me what you used on your ceiling, both the material and the gloss type on your paint (was it a semigloss)? It looks so beautiful and shiny. Oh...Your junk house is absolutely smiling now! What a beautiful job...gorgeous corner of the world...and perfect photo skills to share it all with us! Love your blog...adding you to my blogroll. ....and pass the breakfast casserole, K? Hi. Came over from the Cottage Nest also. What an amazing transformation on your house. And that kitchen -- I could spend all day in there. I'm so jealous! I will be visiting your blog often. Thank you! I've come over from Cottage Nest - and I'm adding you to my feed reader right now. I LOVE your kitchen. I'm ready to come visit and steal your design. The colors - perfect. And your dining room - especially the ceiling! Jumped over from Cottage Nest and wow you are living my dream! Glad your here and I will stop by often. Gorgeous kitchen!!! Absolutely love all your colors. And the view!!! You've done an amazing job at fixing up your "Junk House"...can't wait to see more! What an awesome re-do!!! LOVE IT!! I would love to have this kitchen. AMAZING transformation! Give yourself a pat on the back~you have talent!! This is gorgeous! I'm so glad Jen sent us on over! Oh, and for the mousey issue, have you tried filling in any openings with steel wool? They don't like to chew on it, so they give up and go elsewhere. Elsewhere is good. Wonderful transformation! I could sit in that kitchen forever! I re-did my kitchen about 6 years ago but seeing yours makes me want to do it all over again. It is fantastic! Now, to convince the hubby!! What a great kitchen! I like that it looks like you cook in it and have a wonderful time....some of the houses here in S. Calif. are so small because people don't cook as much! but I'm lovin' your kitchen and all the wonderful goodies you have everywhere! Great job. You must have had so much fun picking out everything and finding all the perfect things to put in there. I just love it! Your kitchen is beautiful! I love what you've done to the whole house. Such happy colors I also moved into a junker it had a rolled paper napkin in stead of the door knob when we went to look at it and a couple bales of hay in the yard we live in a big city. Thanks to Jen from The Cottage Nest I found you. What incredible photos you're sharing and I'll most definitely check back often. I came over from The Cottage Nest - I love you home and your blog is beautiful! You have done such a fabulous job of renovating - I can't wait to see more photos. We've used steel wool for keeping mice out - and it usually works, but if they want to get in they will - we live in a house that is 118 years old with a stone foundation! I also found your blog thru the Jen at the cottage nest. Your kitchen is beautiful and so lively! I'm off to read more. Oh my gosh, I'm absolutely drooling over your style! You have got it goin' on girl!!! Found you through ....you guessed it....Cottage Nest. Isn't Jen a dear? You might want to look at my blog, go to the label 'this old house', we fixed up a house from 1869...what a mess. My style is no where near as fabulous as yours though! WOW! Your kitchen is just beautiful!! Your decor is fab - love the colors and kitchy accents. So glad I followed the link from Jen at Cottage Nest! 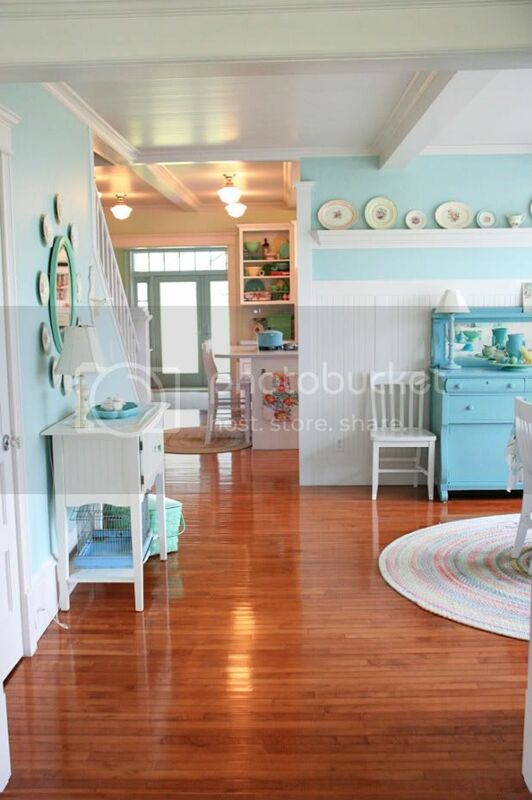 I grew up in an old farm house like the before pictures...yours now looks like such a beautiful doll house! Great job! I love that you left the rat race..us too. We built a home on the family farm and the nearest mall is 2 hours, if I drive fast! We so love the peace and beauty here and I DON'T miss the mall at all~Come say hi :D I'm staying with you and this great blog!! I LOVE this kitchen and your story. Thanks for sharing. We are building a house right now and hoping to move in by Christmas. I love your style! I will be blogging about my decorating adventures and my family and the heart I have for adoption. Come visit me too and we can have tea "together". Funds do not allow a "real" kitchen right now so join me as I try to pull together a makeshift one! I'm pretty sure these pictures just gave me a heart attack. BEEEAAAUUUTTTTIFFFFUUULLLLL! i just hopped over from maryjane's blog and am so happy i did. your home is absolutely amazing! your photography is wonderfully sharp and gosh, i hope you submit these photos to better homes & gardens. INSPIRING! for the past 3 nights while watching tv, i have been combing through old magazines trying to find pictures of my idea of the perfect kitchen. i know i want bright with light cabinets. i know i want to add a little vintage feel. and then i visit your blog. oh my gosh, your kitchen is it!!! I LOVE IT!! well, maybe minus the mice. i have my own. Hi, I just found your blog thru a Sweet Sassy Sadie's blog....this kitchen and your things are exactly what I want someday! Can I please just take it and move it into my home????? No seriously, this is the most perfect kitchen! I would love to come into this room every morning and start my days in it! Thank you for the GREAT photos! If it is OK, I am going to save them for some ideas in my modular home kitchen that I am redoing.....just not to the extent you went....but I sure would like to! :) Thanks again and please stop by and say hello! I love vintage too! this is beautiful, beautiful, ba-you-ti-ful! We too have remodeled our home twice, once as a cottage, and again when we moved here permanently. I wanted white beadboard cabinets just like yours, but I was overruled by hubby. He was also sick of ripping out projects he had recently finished and I didn't have the fortitude to force the issue (I was worn out too). but, I really enjoyed your photo's. You are right to be so proud of it. The fresh colors of the decor are so cheerful. i found you through cottage nest today. i am so glad! But you have given me hope and inspiration on what 'could be'. BTW,I found your site today from Old Centennial Farmhouse. 2 beautiful sites! So glad I found you. Teresa .... LOVE your kitchen. It's hard to believe it is the same space. Love the vintage touches, the awesum auqa and the amount of light. Beautiful. I cannot believe that this is my first visit to Meadowbrook Farm. What a treasure of a find. My husband and I bought a 100 year old house this last summer and we are (well he is anyway) hard at work on renovating it. I can hardly wait for him to get home tonight so I can show him your blog and all the before and glorious after pictures. Love your eye for color and all things vintage so much. Teresa, Country Living, should look you up, if they haven't already. Thank you for sharing you spectaular and inspiring remodel and all your lovliness with the rest of us. So, I stumbled on your blog tonight and this is one of the first posts I'm reading. I shouted out loud, "WHAT!?!" when I saw the first before and after pictures. Then I said, "HOLY cow??" for the next pictures. This is THE most fun, amazing remodel I've seen. SO terrific and fun! I love it! OK, off to go explore the rest of this terrific blog! Seriously, your pictures look like magazine pictures! Looks wonderful! So happy I found your blog. Can't wait to see more. Wow it's absolutely gorgeous. 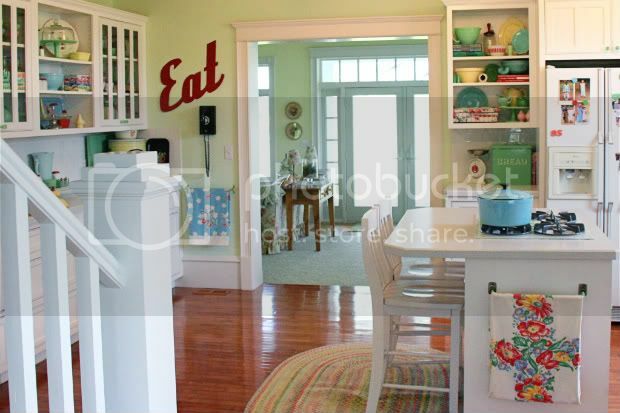 Love the wall colors, the cabinetry, the painted furniture in the dining room. Love it all! Found your via Hooked on Houses. Love the kitchen, especially the wall color and that fab cabinet hardware! I'm going to look through your blog because I must see a full shot of that buffet in the dining room, too! 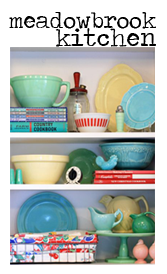 I'm visiting your blog from the Hooked on Houses link, too: what a wonderful kitchen redo!! You have fabulous taste for the retro vintage look! I LOVE the salt & pepper shakers in the photo at the top of your blog!!!!! Your kitchen re-do is so fabulous!It is really hard for me to believe those after shots were really a reality at one point!! 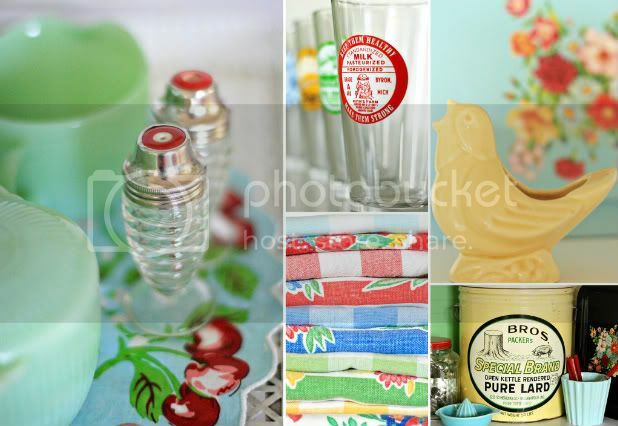 Love the bright cheery nature of it as well as the fun vintage touches. Love that blue accent colored wall!! I'm keeping it as an 'inspiration' pic for my files. Thanks! 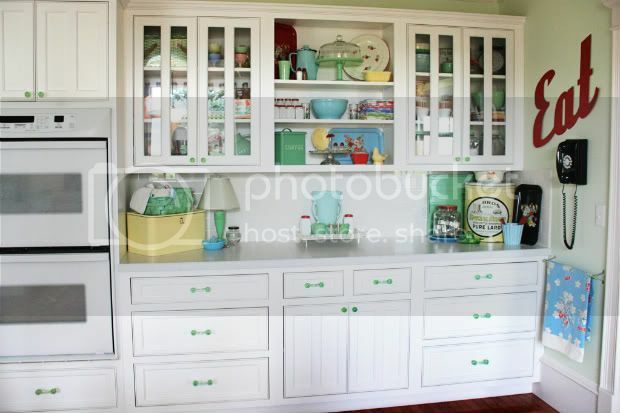 I too have painted white cabinets with green glass knobs but my transformation doesn't come close to yours. Stunning! I love your style and you win my (fake) prize for new fave blog! You and your family must be so very proud of the wonderful make-over. It is a work of art. Congratulations. You were certainly meant to leave the city, find this property and re-create a home. By the way, I love the fact that you have the black dial phone hanging on the wall. It so goes with your overall theme. OMGoodness I do believe I found my kitchen of my dreams! Just charming. I just found your blog and am really enamored of your style. Is there any way you could let me know what color paint you have used in your kitchen ? It's the perfect shade of blue ! ohh my word. i love the dramatic change. obviously, a lot of work...but goodness it was well worth it!! the colors you chose: LOVE!! 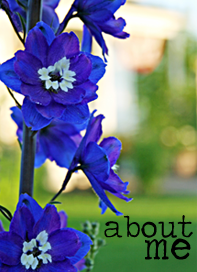 I'm new here- read about you on Rhoda's blog, I think- I absolutely love your beautiful pictures! Your color scheme is my favorite, and I enjoy the mountains and cool-weather flowers-- I live in southeast Texas, where we have to plan our gardens in terms of what can survive the heat of July and August, and many days of 95+ temps! Love it ... beautiful. Fun blog and nice to meet you! This is too adorable for words! Makes me miss my cottage kitchen in our first home. Wonderful job! This is the cutest stinkin' kitchen redo ever! i love it! I LOVE your kitchen!! It's fresh & comfy & beautiful!! This is seriously my DREAM kitchen! I love everything about it :) We'll be building in a year or so and I would love to create a "look" like yours, although I'm not sure we can where we live. Pretty sure I won't get a lovely hardwood floor since wood is very, VERY expensive here. But I'm definitely saving this post in my "design" file! What you did to your house just impresses the heck out of me and I can't help just staring at it and taking it all in. You have to join in on my party on Feb 1st! I love your kitchen but wondering how you manage to keep things clean with kids?? Are you washing your cabinets daily? Also where did you find those awesome little milk glasses in your collage pic? Saving your whole house in my dream design file! I see the teal dutch oven! I keep mine ontop the stove as well! Your kitchen is gorgeous! I love all the color. My favorite is your collection of Fire King. My late mother started me collecting a couple years before she passed away. She gave me a couple plates and a gorgeous platter! I don't have much so I mix it in with all my other colors. I too love turquoise. I just started using it a little bit in my kitchen. I love to come visit your blog and dream. Your photography is stunning. I'm still learning about my camera and slowly stepping into using it manually. You know what is really sad for me... I took out awesome old wooden cabinets with glass knobs about twenty years ago and replaced with new cabinets that I now hate. I would love to have my old cabinets back. stupid me. You have an awesome blog and have done incredible things. I will be back for more. So beautiful! Your vintage collections are to die for. May I ask what your kitchen door handles, the green ones are made of? I have just found your blog through Allsorts on Pinterest, so glad I did! Your home is stunning. I just found your blog and I am in LOVE!!!! Can I ask where you bought your pastel braided rugs? We are building our farm house on 92 acres. 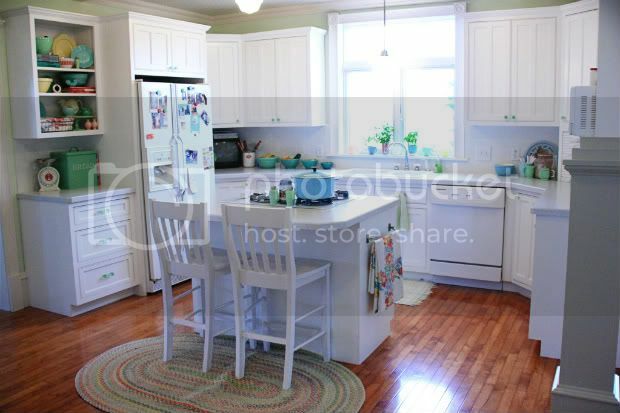 Your kitchen is exactly what I need to go with my farm sink and Wedgewood stove! Thanks for the inspiration! It is such an inspiration, this kitchen remodel!! A note about the mouse: ditch the foam---I filled the gaps w/real steel wool---no more mice! I really appreciate your work and very amazing and important information about the rattan garden furniture which have share in this blog.